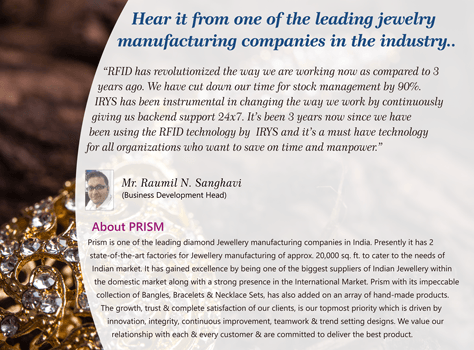 Press Releases - Irys Pte. 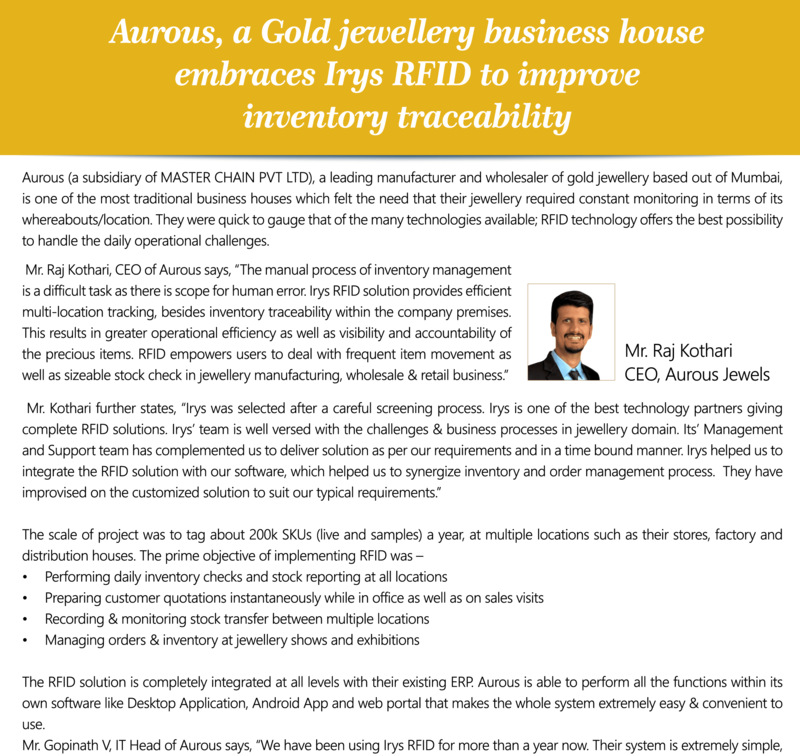 Ltd.
Aurous (a subsidiary of MASTER CHAIN PVT LTD), a leading manufacturer and wholesaler of gold jewellery based out of Mumbai, is one of the most traditional business houses which felt the need that their jewellery required constant monitoring in terms of its whereabouts/location. 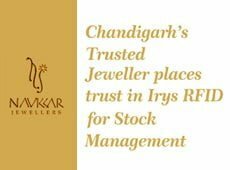 They were quick to gauge that of the many technologies available; RFID..
Over the last decade and a half, Navkkar Jewellers has grown consistently to established itself as one of the leading & most trusted Jewellery brands in Chandigarh and much of this success is attributed to the dynamic Leadership – initially by Lt. Col. K.C. 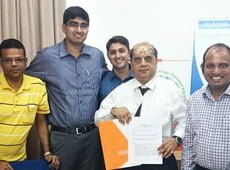 Jain and now by his son, Mr. Vivek Jain. 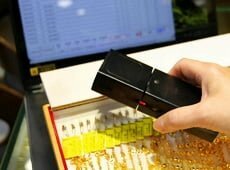 Be it..
Singapore “Old is Gold” and this applies quite literally to On Cheong, one of oldest and most trusted heritage jewellery brands in Singapore. 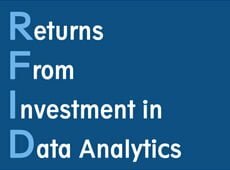 Though at On Cheong, Old certainly does not mean outdated. 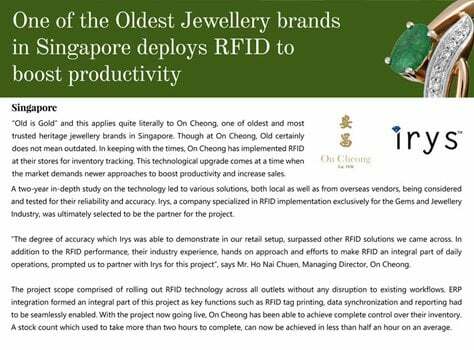 In keeping with the times, On Cheong has implemented RFID at their stores for inventory tracking. 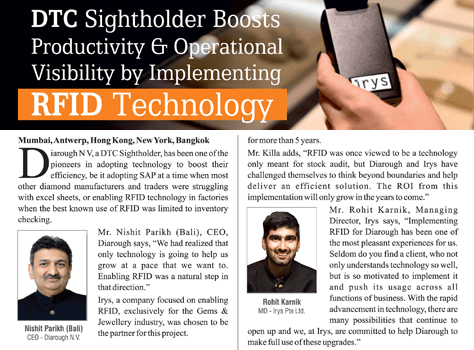 This technological upgrade comes at a..
Mumbai, Antwerp, Hong Kong, New York, Bangkok Diarough N V, a DTC Sightholder, has been one of the pioneers in adopting technology to boost their efficiency, be it adopting SAP at a time when most other diamond manufacturers and traders were struggling with excel sheets, or enabling RFID for jewellery in factories when the best..
Singapore – Jewellers are taking a shine to technology that enables their staff to be more productive and reduces the high stress levels caused by the long time it used to take to locate missing high-value items. 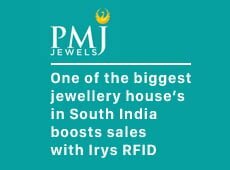 About 15 local jewellers are using RFID (Radio Frequency Identification) technology, which cuts down the amount of time..